At a time when British identity is being reassessed and questioned, W.J. 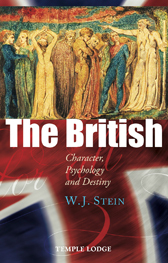 Stein's classic and timeless study, with its penetrative analysis of the character, psychology and destiny of the British people, takes on new relevance. Stein, a political refugee from Austria, spent the last 24 years of his life in Britain. As an outsider, he was able to view British custom and culture with objectivity. As a student of Rudolf Steiner, he brought years of spiritual study and wisdom to the writing of this book, enabling profound insights. In this concise and aphoristic study, Stein writes on everything from geography, history, politics and economics to the arts (in particular painting and music) and religion. He also reflects on the British concept of freedom, as well as Great Britain's somewhat mysterious propensity to extend itself - and its language and culture - across the world. DR W.J. STEIN (1891-1957) was one of the original pioneers of anthroposophy. A personal student of the Austrian philosopher Rudolf Steiner, Stein taught History and Literature at the first Waldorf School in Stuttgart, although his training was in Mathematics, Physics and Philosophy. Through his efforts to master the new disciplines, Stein developed groundbreaking insights into the Parzival narrative, which led to his book The Ninth Century and the Holy Grail. In 1933 Stein came to London, where he worked with D.N. Dunlop in establishing the first World Power Conference. Stein was a prolific lecturer and editor of the seminal journal The Present Age.